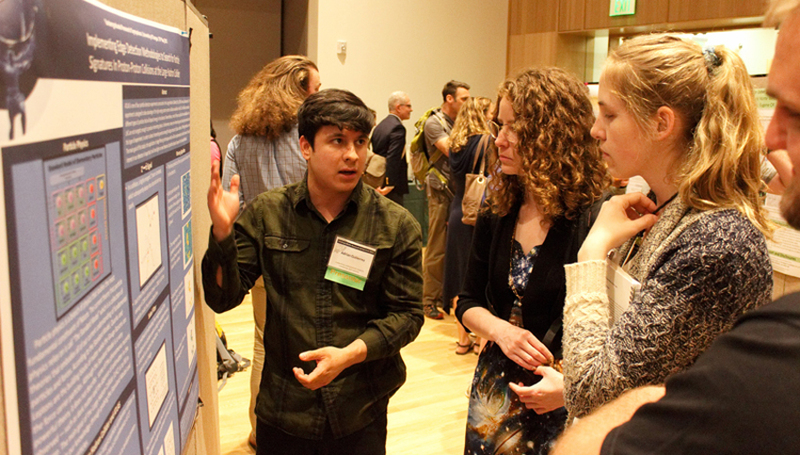 Five UO undergraduate students walked away as winners from the seventh annual Undergraduate Research Symposium for their individual projects, which covered topics on speech problems, genetics, defrosting vehicle windows, food access and water's role in global health crises. This year’s event, held May 18, featured 242 presentations, including 125 posters and 99 talks, from 60 different academic majors. Entries came from students in the natural and physical sciences, social sciences, humanities, fine and performing arts and design. Linguistics major Drew McLaughlin took first place for oral presentations, winning a $500 prize for “Individual Variation in the Perception of Different Types of Speech Degradation.” Her talk is on the UO Channel. Her study looked at how people filter information they are hearing when speakers’ words are degraded by such things as environmental noise or speakers’ accents. She found that listeners employ somewhat different filtering strategies based on the interference that is present. McLauglin’s research was supervised by linguistics professor Melissa Baese-Berk and funded by an Office of the Vice President for Research and Innovation undergraduate fellowship. Biology major Collette Goode won the $300 top prize for a biology poster titled “Synaptic Protein Distribution in the Developing Brain of Danio rerio.” Her work focused on protein activity during early development of synapses in zebrafish. Disruptions in protein interactions have been linked to neurological conditions such as autism spectrum disorder and Down’s and Tourette’s syndromes. Her work was done under the mentorship of professor Phil Washbourne and Alexandra Tallafuss, senior research associate in neuroscience. The National Institute of Child Health and Human Development’s summer research program supported the project. The top poster award, a $500 prize sponsored by the Undergraduate Research Opportunities Program, went to Renee Dobre for her “Window Water Shield.” The project aimed to create a window device to reduce heat waste and better control the buildup of condensation that develops inside vehicles under varying environmental conditions. Her team found success with their vapor barriers. Dobre, an architecture student mentored by professor Alison Kwok, teamed with fellow students Simone O’Halloran and Robbyn Wallis in the project. Kiara Kashuba, a student in the Department of Planning, Public Policy and Management, won the Food Studies Award competition, worth $300, for “Textbooks or Groceries: Exploring the Prevalence, Correlates, and Consequences of Food Access Among University of Oregon Students.” She is studying how demographic factors fuel feelings of food security, and how that feeds their academic success and overall wellbeing. Eugene’s Whole Foods Market supports Kashuba’s project, which is being supervised by professor Laura Leete. The International Studies Award went to Scout Galash for her talk on “Water: A Social Determinant of Global Health.” Her $300 first-place project is looking at the effects of clean water and sanitation in crisis situations such as war and political upheaval. In her talk, Galash sought to show similarities between the water crises in Flint, Michigan, and Aleppo, Syria, as an example of how global health issues are as relevant in the United States as in developing countries. Galash, a student in the Department of Human Physiology, was mentored by professor Kristin Yarris.